For a man who has been known to say some uncomplimentary things about bankers, Warren Buffett sure does love his bank stocks. By one recent analysis, the "big banks" and regional banks that Berkshire Hathaway has amassed in its portfolio of stocks adds up to a $50 billion market cap banking company—four of Berkshire Hathaway's top 11 holdings in the stock market are in banks and other financial services companies. For a little perspective, the combined market value of Buffett's bank stock holdings roughly equals the market cap of Deutsche Bank or PNC Financial and would rank eighth overall in terms of U.S. banks by size. That $50 billion banking "company" stocked away within Buffett's empire is also a sizable piece of Berkshire Hathaway's approximately $350 billion valuation. "I don't think it's remarked enough what a huge position that has become," said David Rolfe, chief investment officer of investment firm Wedgewood Partners, a Berkshire shareholder. 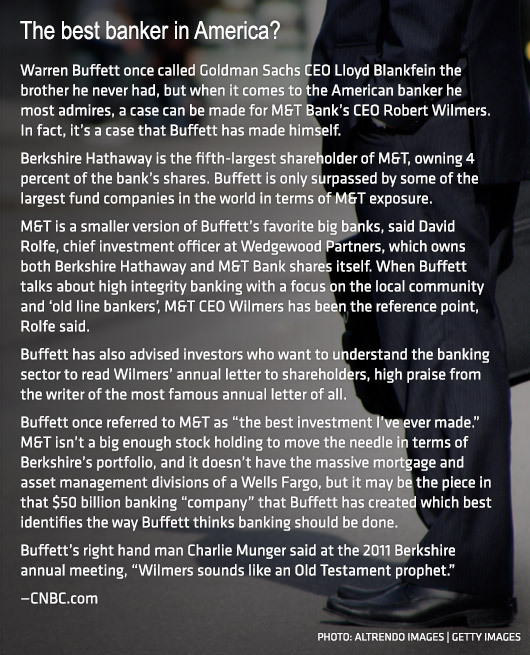 "He likely has the biggest stake in bank stocks of any U.S. investor other than a large mutual fund company." Investors can learn a lot about the financial sector by taking a look at Buffett's approach. To begin with, by looking at the link between two of Warren Buffett's classic investing rules and financial stocks, it's easy to see how banks have become a cornerstone of Berkshire Hathaway's holdings: One is to bet on industries that other companies need in order to do business and make the economy run, and the other is to be greedy when other people are scared. A quarter of Berkshire's operating company profits—income from Buffett's wholly-owned subsidiaries—come from insurance, which, like bank capital, is something other companies can't live without. This acumen is something Buffett has noted repeatedly through the years. The sweet terms Buffett has extracted in snapping up stakes in financial companies at times of crisis, including American Express (way back in the 1960s), Bank of America and Goldman Sachs, which were the signature post-crash Buffett bailout bets, led to multibillion-dollar returns. But for ordinary investors looking to follow Buffett's banking bets, the most reliable path may be to follow his less opportunistic and more long-term bets on the sector: Wells Fargo, Berkshire's biggest outside holding, and Minneapolis-based U.S. Bancorp. Wells Fargo and U.S. Bancorp are so alike, they even make some of the same boasts, like citing data that explains why they fit into Berkshire's emphasis on well-managed companies that it can own "forever"—Buffett's favorite word when referencing an investment time horizon. At a Barclays conference in September, Wells Fargo and U.S. Bancorp presented virtually identical slides touting their rank as the first and second best-performing major U.S. banks in return on equity, return on assets and the so-called "efficiency ratio," which analysts use to measure how effectively banks manage costs. By all three measures, U.S. Bancorp, the nation's fifth-largest bank, is tops, and Wells Fargo is No. 2. They also pay out more of their earnings to shareholders, in dividends and share buybacks, than any bank other than Citigroup. Both banks mostly eschew the razzle-dazzle of trading and investment banking to focus on bread-and-butter businesses, like mortgage and car lending, as well as Main Street–oriented commercial loans. U.S. Bancorp has nearly doubled its consumer-loan market share since 2007, the year after Buffett began building what is now about a 4 percent stake, and grabbed almost 7 percent of the market for middle-market syndicated loans, up from nearly zero before the recession. Wells Fargo is the nation's largest lender in mortgages, small-business lending and auto loans. In particular, both banks have worked on building up fee income to reduce their sensitivity to interest rates and credit risk. Wells Fargo generated 49 percent of its second-quarter revenue from fees, and U.S. Bancorp generated 46 percent, ranking 1 and 2 among top U.S. banks by the ratio of fee income to total assets. Bank of New York Mellon, which has become one of Berkshire's top 10 holdings in recent years even though it isn't similar in business mix to his other favorite banks, is a different way to approach the rate-sensitivity problem: 79 percent of BNY Mellon's revenue is fee revenue from services, including investment management and bank custody and clearing, which can be described as showing a "hyper-sensitivity" to rate-based banking. Given their focus on lending, the knocks on Wells Fargo and U.S. Bancorp have been persistently low-interest margins (the spread between what banks pay for deposits and collect on loans) and sluggish loan growth, said Raymond James analyst Anthony Polini. Loans should pick up in line with the resurgent U.S. economy, and the two banks' spreads are still wider (i.e. better) than peer banks' spreads, Polini said. U.S. Bancorp has also come in for criticism because of its relatively high valuation, trading at 12.7 times its estimated 2014 earnings per share, the same as Wells Fargo. By comparison, JPMorgan Chase is currently valued at 10.8 times earnings. "We really are more valuable than we are large,'' Davis said at the Barclays conference in New York City. CLSA banking analyst Mike Mayo has a different view: His preferred bank stock bet is Citigroup, a turnaround story that Citi bulls have argued can get a bigger bounce from the recovery and cost-cutting. Over the last two years, Citi has outperformed most big banks, including Wells Fargo and U.S. Bancorp, trailing only Bank of America, which Buffett bought into in 2011. But since mid-September 2008, the top-performing big banks have been Goldman Sachs and Wells Fargo. U.S. Bancorp has actually lagged the broader market and other bank stocks since 2012, while still rising 21 percent. Buffett's response over the years with bank stocks has generally been to buy more. He added to his Wells Fargo stake every year for a decade, before leveling off this year, and in addition to saying that Wells Fargo would never disappoint when it comes to revenue, Buffett said he would buy all of both Wells Fargo and U.S. Bancorp if regulators would allow it, though probably not tomorrow—he trimmed his U.S. Bancorp holding in 2012 and has added to it only modestly since. "Between Wells Fargo, Bank of America and U.S. Bancorp, he has U.S. banking covered," Rolfe said. In recent years, how much Buffett has made from the deals to buy into Bank of America and Goldman Sachs during financial distress highights his rule to be greedy when others are fearful, and a lot of bank investors have been very afraid since 2008. At the depth of the financial crisis in September 2008, Buffett struck a deal to buy $5 billion of Goldman's preferred stock, paying a 10 percent annual dividend, and a warrant that, as later amended, gave him 2.8 percent of Goldman, whose market cap is about $82 billion. In 2011, Buffett invested another $5 billion in Bank of America, getting a 6 percent payout and the right to buy 700 million shares by 2021 at $7.14 a share. Because Buffett hasn't yet exercised his right to buy Bank of America shares, it isn't listed among Berkshire's top stock holdings. But Buffett wrote in his recent annual letter to shareholders that Bank of America is "in effect, our fifth-largest equity investment." Rolfe said that at the current Bank of America share price of $17, the investment is worth roughly $12 billion, "and that's a conservative estimate." If Bank of America rises to $25 to $30, which a bank analyst said this week is likely to occur well before Buffett plans to exercise the warrants in 2021, it's an investment that should go down as one of Buffett's best, even if not a needle mover for Berkshire because of its size. The "where others fear to tread" side of Buffett's financial investments stretches all the way back to his first bet on American Express in 1963, Cunningham said. Berkshire first bought into the credit card company after the so-called "salad oil scandal," where it took losses on loans to a client who was putting a layer of salad oil on top of tankers full of water and using the value of tanks full of oil as collateral. Investors would have done well to follow Buffett into Bank of America, but returns for mere investing mortals on Goldman have been ho-hum. Bank of America is up 80 percent in the past two years, even though it's still well behind top peers on profitability and loan growth. Goldman has jumped about 44 percent since Buffett invested in 2008, trailing the S&P 500 by about 37 points. "Bank of America plays into Buffett's affection for distressed assets," Polini said, adding, "Bank of America is turning into Wells Fargo right now." The Raymond James analyst explained that it has a diversified collection of revenue-generating business units but is moving away from the kind of financial engineering associated with Goldman and JPMorgan. Well past its salad (oil) days, American Express—Buffett's third-largest holding overall and second only to Wells Fargo in total banking shares held by Berkshire—has outperformed virtually every major financial company since 2008, rising 119 percent since Lehman Brothers' collapse. The company, which spun off its corporate travel agency this year, has ridden momentum in its core charge-card business. And like Wells Fargo and U.S. Bancorp, American Express is running to minimize its exposure to interest-rate and credit risk as much as a lender can. Less than 20 percent of its revenue comes from interest income, thanks to its relatively high fees, Keefe, Bruyette and Woods analyst Sanjay Sakhrani said. As the economy improves, consumers will borrow more and give Amex a cyclical lift, he said.